The walls are fallen, but the roads endure." Ethelyn Hartwich . What shall endure?. And walls to keep strong men apart, secure. The Moyenne Corniche, so called because it is sandwiched between a higher and a lower cliff road, is 31 kilometres long and stretches from Menton to Nice . It is a modern road, tacked on the side of the cliffs, with exceptionally pretty views of the coast. It easily skirts the backbone of rock that form this escarpment and cheerfully winds its way around the Mediterranean countryside. It affords a superb perspective at the coastal stations where it leads and offers the visitor an early view of the astonishing village of Eze. Most of the views afforded by this route are of the coastline, but there are many places along the route where the visitor can stop and enjoy the beautiful scenery. At just about two kilometres from Nice you arrive at the Villefranche neck, 150 metres high, from where you can see the Cap Ferrat. At one entrance to the 180 metre tunnel there is a magnificent view of Beaulieu, Villefranche, Nice and the Cap d'Antibes . At the other end of the tunnel the old village of Eze appears suddenly, perched on its rock. Just over to the right you can see the Tete de Chien promontory which dominates Monte-Carlo. 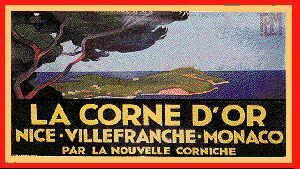 THE CORNICHE INFERIEURE is the road that runs below the Moyenne Corniche mentioned above. It is 33 kilometres long and was built by the Prince of Monaco. Following the contours of the coastline, the Corniche Infèrieure serves all the stations of the Riviera and would be the route for you if you intended to visit the interesting peninsular of Cap Ferrat and, of course, Monte-Carlo . THE GRANDE CORNICHE, 31 kilometres long, was constructed by Napoléon 1er on the site of the old Route Aurèlienne. It is the highest of these cliff roads and rises as high as 450 metres above the Principality of Monaco. The views from here are thrilling and this route also offers a gateway to Roquebrune.